The origin of the term "Amazon feminism" can be traced to several sources, including Thomas Gramstad. Gramstad sought to combine Ayn Rand's unique depiction of heroism along with then-modern feminist ideology and Amazonian concepts. This was partly inspired by Lane and Worth's In Search of the Woman Warrior. In the early-1970s, Gloria Steinem drew attention to this concept with her praise of Wonder Woman as a feminist icon, and her criticism of DC Comics' decision in 1968 to change Wonder Woman's powers. Wonder Woman's famous equipment - her bullet-proof bracelets, lasso of truth, and ability to glide on wind currents - had been replaced with mere-mortal kung-fu. The year after Steinem generated attention toward this issue, Wonder Woman was changed back and her popularity with young female readers increased. ↑ Gramstad, Thomas (1999). Gladstein, Mimi Reisel; Sciabarra, Chris Matthew, eds. 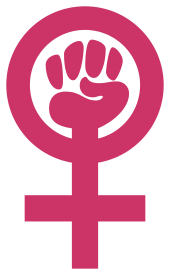 'The Female Hero: A Randian Feminist Synthesis' in Feminist Interpretations of Ayn Rand. Pennsylvania State University Press.